The U.S. military is experiencing the same demographic changes our nation and our world are experiencing at-large. By 2055, the U.S. will have no single racial or ethnic majority, as the population shifts to being more foreign-born. 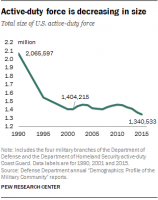 Our active-duty military has shifted from being 25 percent (in 1990) to 40 percent (in 2015) non-white. This increase to 40 percent is representative of the 44 percent of all Americans ages 18-44 that were non-white in 2015. 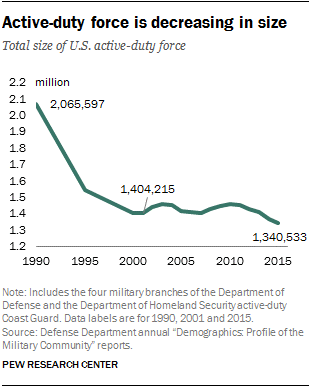 The military remains over 3.5 million strong, but its number of active-duty military is decreasing, in addition to the share of Americans enlisted, with a 0.1percent decrease from 2009 to 2015. Of the 3.5 million members, 1.3 million are active-duty with 68.7 percent being white, 17.3 percent are black, 4.2 percent are Asian, 4.2 percent are unknown or other, 3.2percent are multi-racial and 1.3 percent are American Indian or Alaska Native. Women have also made strides in the military, by increasing their share of DOD active-duty military personnel, active-duty officers, and enlisted personnel. Women now make up 19 percent of the Air Force, 18 percent of the Navy, 14 percent of the Army, and 8 percent of the Marines. As our world and country changes so will our military to reflecting our society and the ever-changing world. Author: Paula Acevedo is a graduate of American University’s School of Public Affairs with a Master’s in Public Administration and focus in Public Policy Analysis. She holds a BBA in Marketing and Management, with a minor in Business Law from Florida Atlantic University. Paula is currently a Research Associate at Council for a Strong America. She can be reached at [email protected].